In television variety shows or comedy programs various sound effects and music are combined with humorous scenes to induce more pronounced laughter from viewers or listeners . The aim of our study was to clarify the optimum insertion timing of symbolic music to induce laughter in video contents. Symbolic music is music that is associated with a special meaning such as something funny as a sort of “punch line” to emphasize their humorous nature. We conducted a series of rating experiments to explore the best timing for insertion of such music into humorous video contents. We also examined the affects of audiovisual contents. The experimental stimuli were four short video contents, which were created by mixing the two video (V1 & V2) and four music clips (M1, M2, M3 & M4). The rating experiments clarified that insertion timing of symbolic music contributed to inducing laughter of video contents. In the case of a purely comical scene (V1), we found the optimal insertion time for high funniness rating was the shortest, at 0-0.5 seconds. In the case of a tragicomic scene, a humorous accident (V2), the optimal insertion time was longer, at 0.5-1 seconds after the scene; i.e., a short pause before the music was effective to increase funniness. Fig. 2 Subjective evaluation value for the funniness in each insertion timing of symbolic music for each video scene. very high, seen in the table summarizing the test. 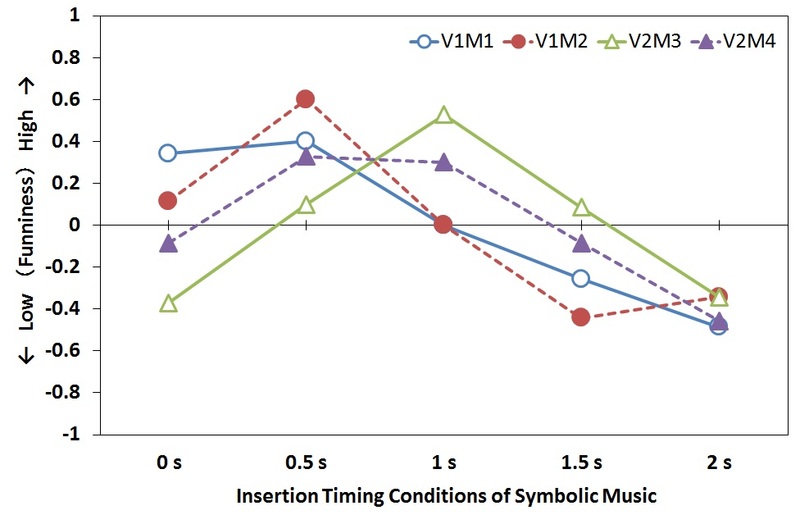 Table 1 Correlation coefficient between the optimal timing for symbolic music and the affects for audiovisual contents. In television variety shows or comedy programs, when symbolic music is dubbed over the video as a punch line just after the humorous scenes, insertion of a short pause of between half a second and a full second is very effective at emphasizing the humor of scenes, and increasing the impressiveness of viewer-listeners. 1. Kim, K.H., et al., F. Effectiveness of Sound Effects and Music to Induce Laugh in Comical Entertainment Television Show. The 13th International Conference on Music Perception and Cognition, 2014. CD-ROM. 2. Kim, K.H., et al., Effects of Music and Sound Effects to Increase Laughter in Television Programs. Media & Information Resources, 2014. 21(2): 15-28. (in Japanese with English abstract).